We’ve thrilled to Isaiah Mustafa’s towel-draped, manly-man physique. We’ve marveled at the brilliant, single-shot commercial in which his Old Spice washed body strolls from beach to log roll to kitchen, then jumps into a hot tub — only to have it break way, revealing him astride a motorcycle. And we’re awestruck that the agency Widen + Kennedy in Portland followed up the commercials a week ago by uploading to YouTube nearly 190 videos (by my count) featuring Mustafa sending personal responses to Facebook, Twitter and other social media fan posts. The first 67 videos were shot in a single, grueling 11-hour day. One of the best ad campaigns of the year, it’s sure to go down in the annals of marketing history not just for its wit and technical virtuosity, but also for the lessons it teaches us about advertising and social marketing. Repositioning the brand – The Old Spice brand, which had become associated with aging baby boomers, is getting a radical image transplant through a variety of commercials directed at a younger, hipper audience. The Mustafa spots for Matterhorn body wash (aimed at women) are part of a series of spots that use humor to encourage viral Internet spread. Check out the Old Spice Odor Blocker commercials that have created almost as much buzz among post-adolescent males. Integrating traditional advertising with social media – I have no idea what the original media buy was for the commercials, but the earned exposure in print, broadcast and on-line media generated millions of downloads. When the personalized videos were posted (starting around July 13), the campaign moved into the awareness stratosphere. The videos were addressed to such celebrities as Demi Moore, George Stephanopoulos and Apolo Ohno as well as to lesser folks like jsbeats and 1275JDH. Some of the video responses generated two-way dialogue in real time. Clever Sells – There is no better way to capture public attention and generate buzz than through witty, ground-breaking creative concepts. Selling with humor certainly isn’t anything new. One classic: The original U.S. print ads for Volkswagen featuring lots of white space, a tiny photo of the car and only two words: “Think Small.” The first Energizer bunny commercials were literally show stoppers – interrupting fake commercials with the bunny “still going, going . . .” This was advertising that people talked about. Today, the difference is the Internet, which enables the conversation to move at warp speed around the globe, growing its audience exponentially as it travels. So hats off to Old Spice, its agency and Isaiah Mustafa. You nailed it. You leveraged your message across a variety of platforms. And you raised the bar for everyone else. Entry filed under: Advertising, Social Media. 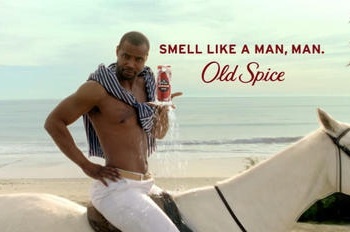 Tags: Isaiah Mustafa, Old Spice, Old Spice commercials, smell like a man, viral.